Hot Toys is on a roll with their releases lately and this time Captain America makes his appearance. 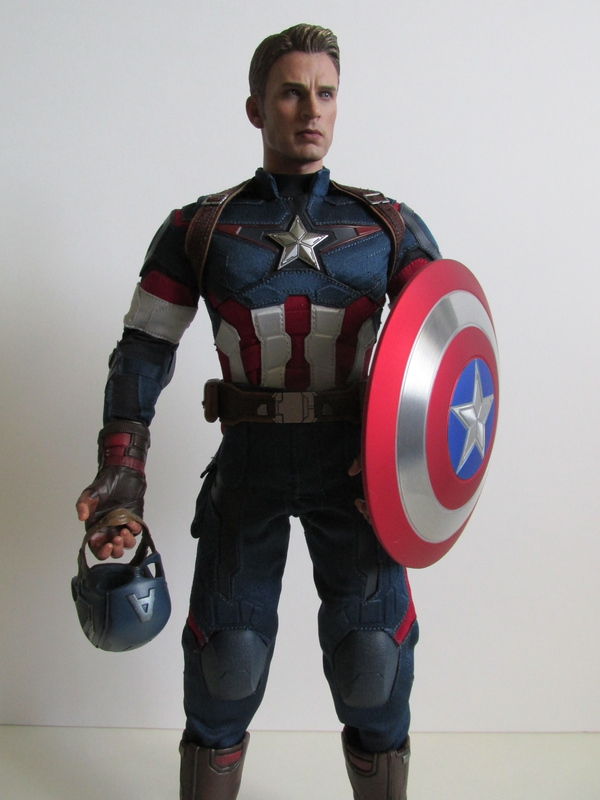 This Age of Ultron Captain America comes off the recent release of the Strike Suit from The Winter Soldier. 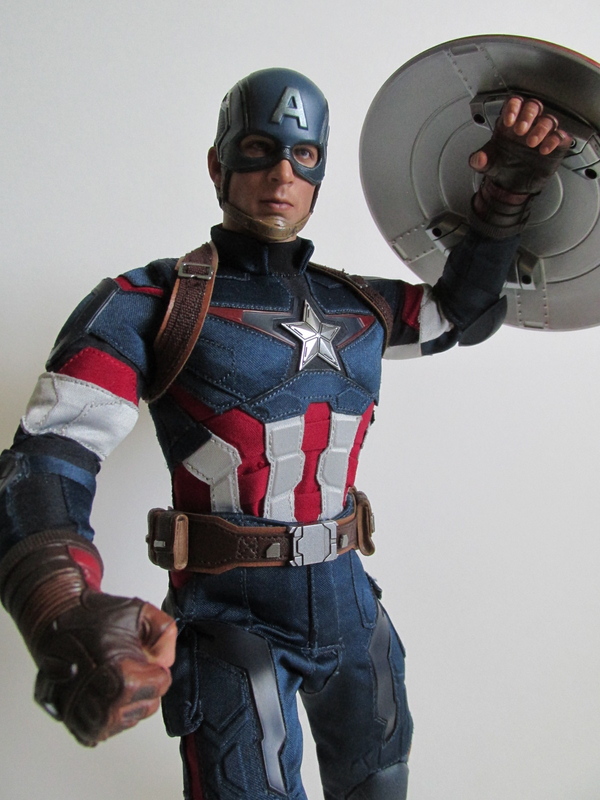 I'm happy to say this figure has improved in strides and could be one of the best Captain America releases we have yet seen. 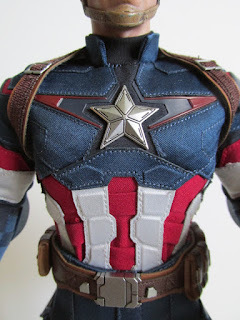 The Age of Ultron and Winter Soldier Captain America's are pretty much the same costume just with different coloring. 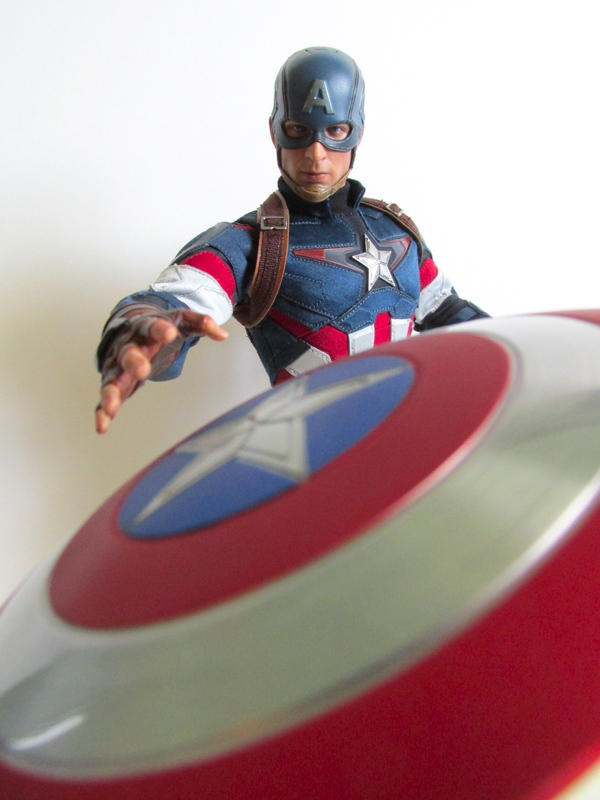 However, the Age of Ultron release has been improved in the articulation department and, of course, the magnet shield. Overall, this is just a color scheme change and the costume is pretty much the same looking as the Strike suit, which could be a reason why this figure came out so quickly and ahead of schedule. 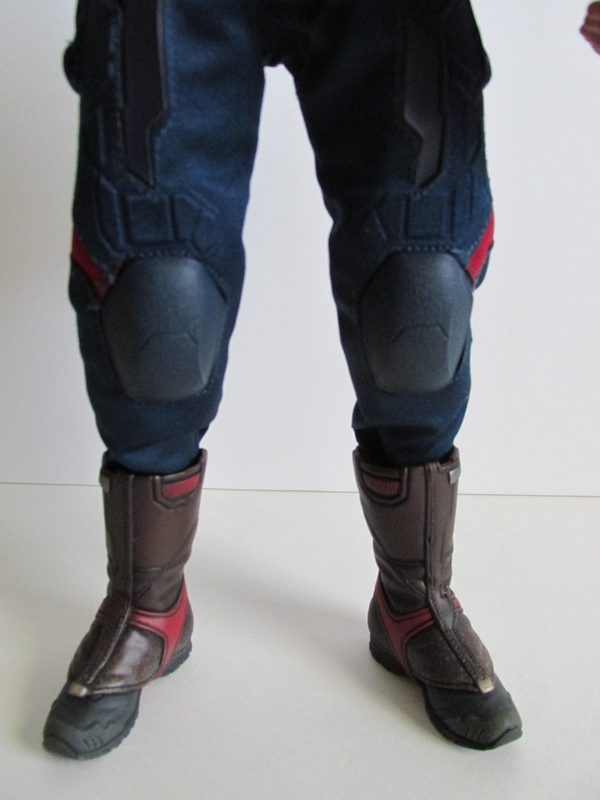 The Strike suit had a fat suit underneath the costume which hindered any movement in the arms. 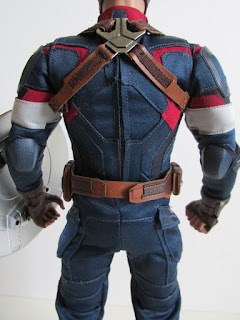 This suit, however, doesn't seem to have any fat suit and hence the arms have a wider range of motion. 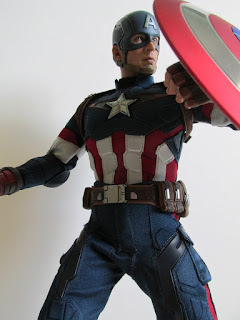 For many this is the reason why many want to buy this version since you can pull off better poses and get more out of figure. 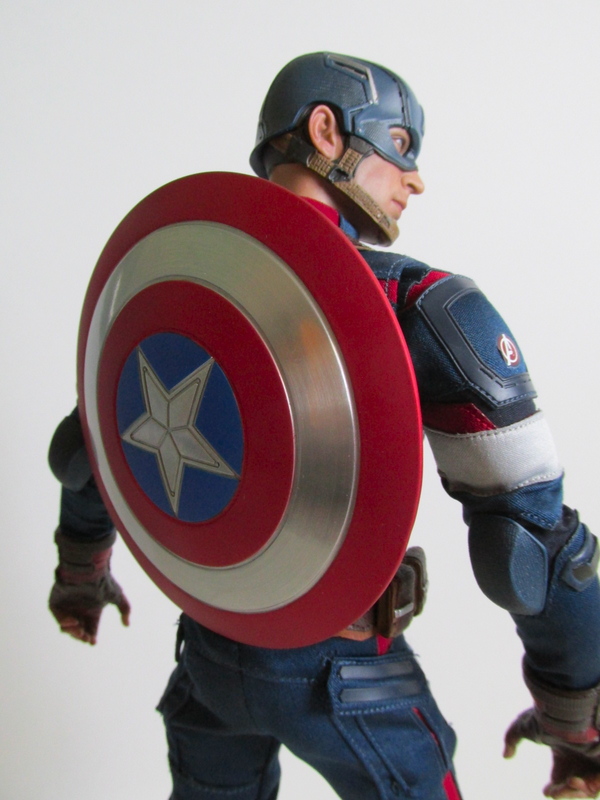 The next best feature is the magnet shield. It is now super easy to put the shield on and like in the movie is a magnet that attaches to his hand with no messy straps to buckle. The shield can only work with one pair of hands while the other hands do not have the magnet. 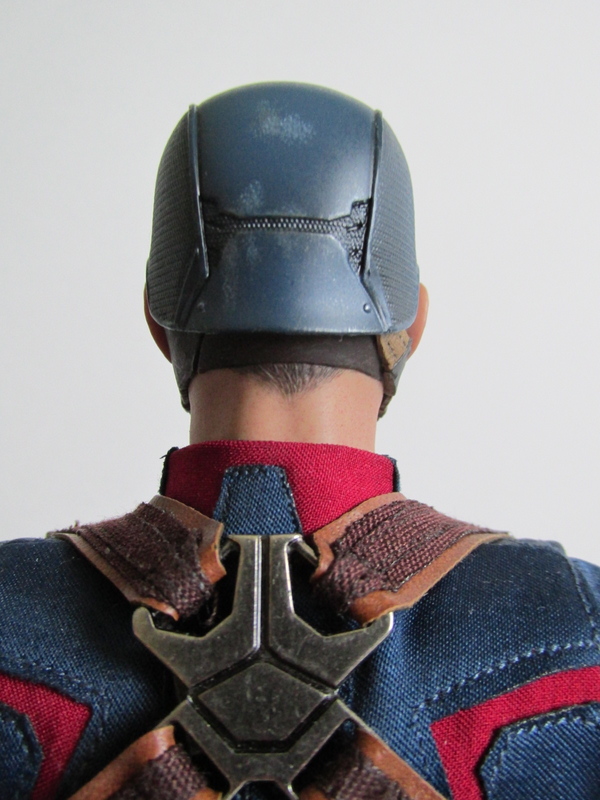 The shield can also easily attach to his back buckle and again super easy to do without the hook. Hopefully, Cap and Hot Toys will stick with this new feature because it just saves so much on time and frustration. 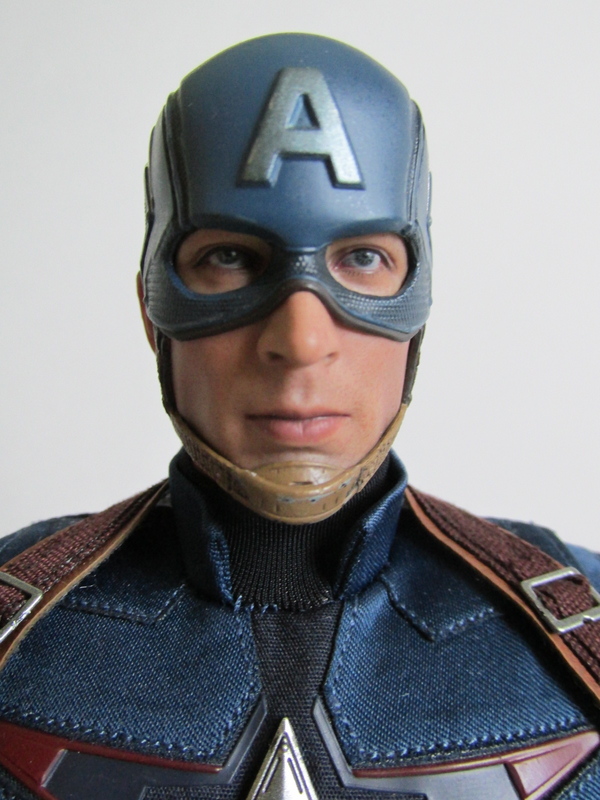 His face sculpt is pretty much the same from the Strike suit except his pupils are looking to his left, which helps to give a look of concern. 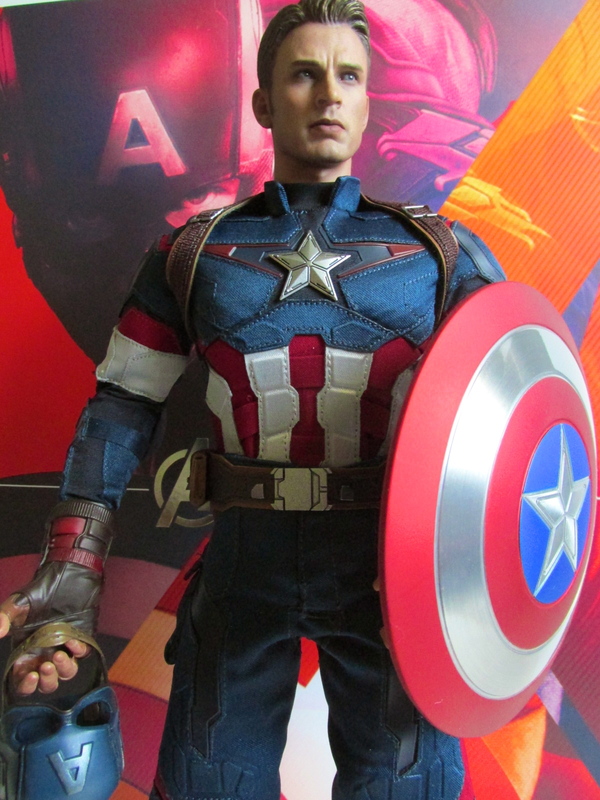 The hair on this figure also seems to be a darker gold color. 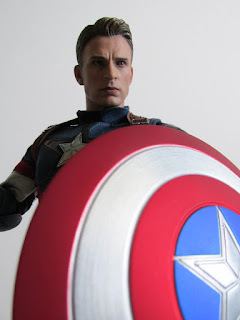 The shield also has a great paint job, which seems to take everything from the past shields and improves upon all of them. This release has some resemblance to the Golden Age Captain America shield only this has no battle damage or scuffs. 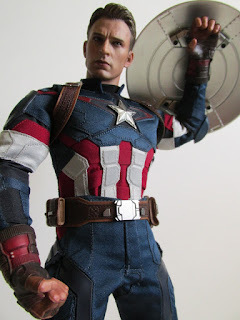 Accessories wise he comes with a pair of shield magnet hands, one right open hand, one left hand for shield holding, a pair of fists, a pair of slightly open hands, empty cowl, and base. 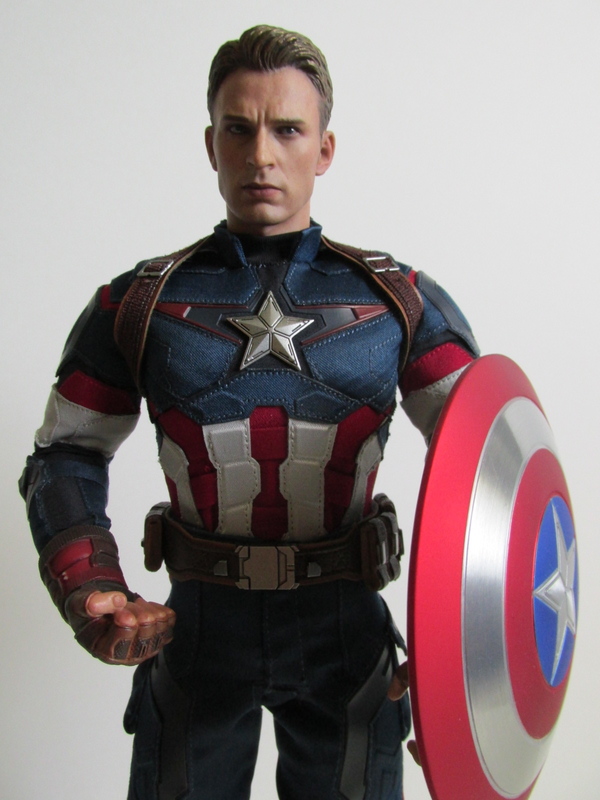 I'm glad this release chose to use different hand poses instead of the usual ones they have released. The hands are also easy to change out mostly because the sleeves have been hemmed so you don't have to worry about the sleeves wrinkling or getting in the way. 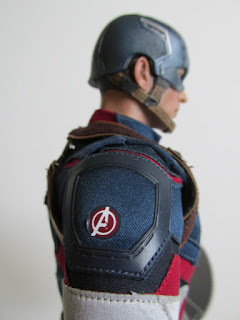 It is too bad that this did not come with broken shield that was seen in Tony Stark's Scarlett Witch dream...that should have been the exclusive version. 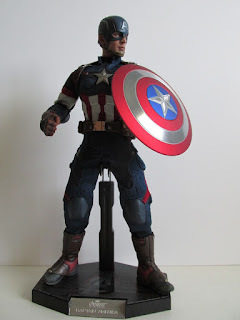 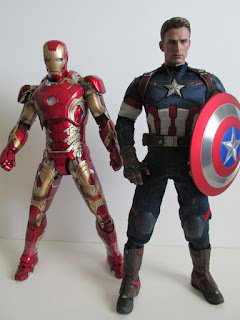 This should have also come with a similar base to the Mark XLIII because Captain America also fits very naturally on that base, and it is very accurate to the movie. 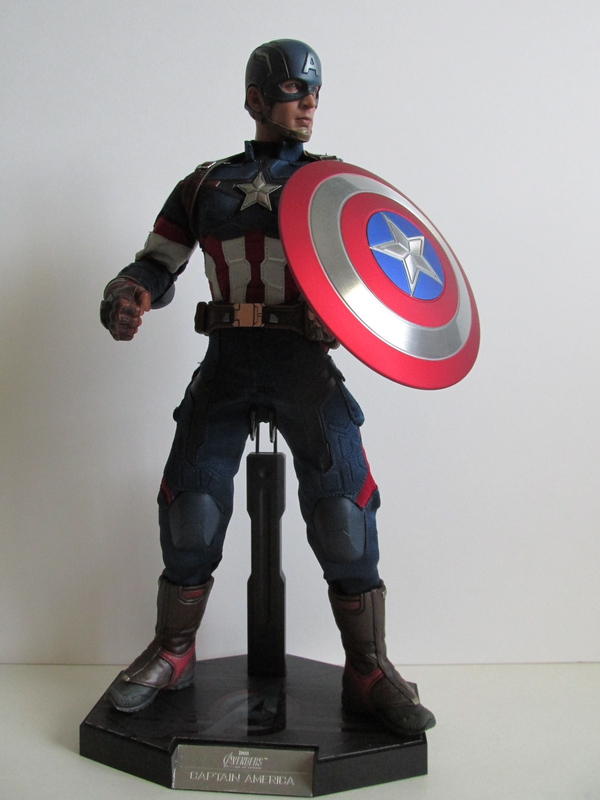 The base it does comes with is also nice, but again I feel it was a missed opportunity. One thing to watch out for is when you switch out the heads. You must tilt the head and make sure the flesh colored stub comes off with the head. If you accidentally take the head off without that stub, then you just broke the head and it won't go back on again properly. 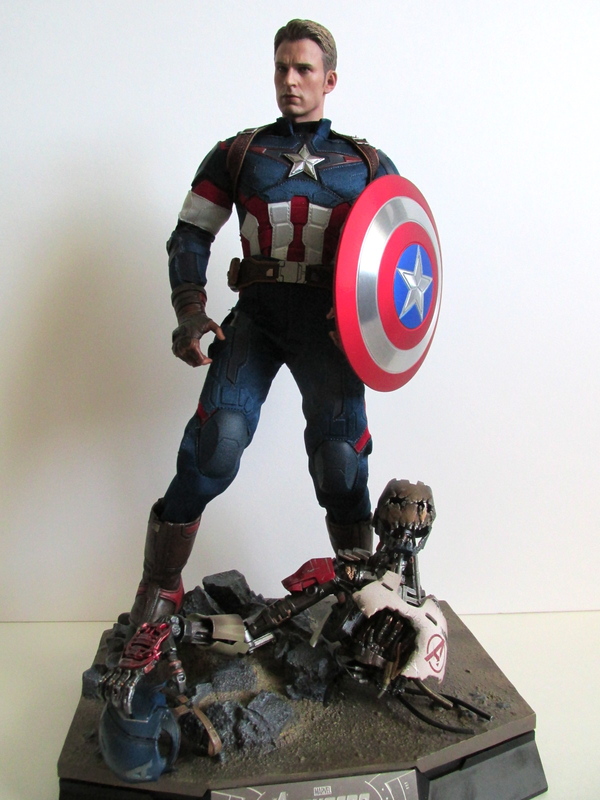 This happened to me on the Strike suit release and now the head loosely sits on the figure and cannot be moved without it falling off. Overall, I'm loving this figure and so happy with the improvements they made. If you have been waiting for the perfect Captain America or deciding on this or the Strike suit, I suggest getting this one. I feel too that this version of Captain America will suffice...until the Infinity Wars.